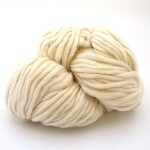 100g skeins of pure British wool super chunky pencil roving, perfect to dye and felt. 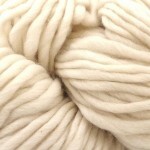 Bella 100% British wool roving is a gorgeous soft, lightly twisted yarn suitable for many textile crafts. The light twist means the yarn is soft and bouncy so even though it's very thick it won't weigh you down but will keep you lovely and warm. Bella is such a versatile yarn for all types of crafts. 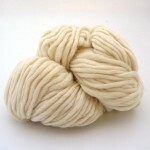 Spinners know this yarn as "pencil roving" and it is particularly useful for plying with handspun yarns. It's an excellent yarn for quilters to use for a number of techniques including Italian quilting, Trapunto and Boutis work & Bella is unseen and is trapped between layers of fabric to create, soft, padded, raised areas. Knitters or crocheters can create simple, easy pieces very quickly using large hooks or needles. Scarves, cowls and accessories are particularly effective when made from Bella and designers and students can create dramatic, experimental sculptural work in no time. If you're a felter you can achieve thick, sumptuous fabrics by knitting, weaving or crocheting Bella, then throwing it in the washing machine or hand felting for brilliant results. Use in all types of weaving from details within tapestries to chunky soft rugs made on peg looms. It's not a particularly strong yarn due to the light twist, so more suitable for a weft than a warp. Dyers can easily create unique colourways by dyeing the wool with hot water dyes. Don't agitate it too much in the dyeing process as it could start to felt, but gently stir and watch the yarn transform into the colours of your choice - whether solid or space dyed. 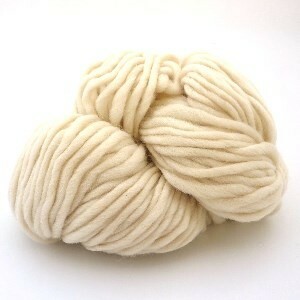 A brilliant and repeatable all round yarn. Wool also has great thermal properties, buying British means it's a very eco yarn as sheep are free range, fair trade, the air miles are minimal and you're supporting British farming.